This Speakerphone is designed for great stereo sound with HD Voice, dual large speaker, which can transfer your calls, music, GPS navigation or any other type of audio from your Bluetooth device. This Speakerphone is designed for great stereo sound with HD Voice, dual large speaker, which can transfer your calls, music, GPS navigation or any other type of audio from your Bluetooth device. It supports private talking, one key to change to phone answer. • Bluetooth version: CSR4.0+EDR, which has high quality for talking. 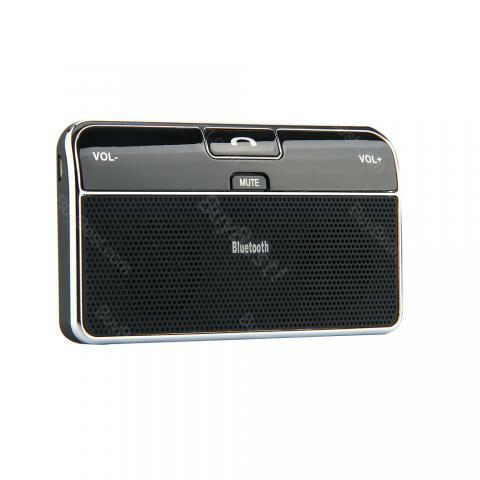 • Dual speaker dual connection, good device for talking in car while driving. • English voice reminder, such as calling number reminder, navigation reminder, etc. • Built-in 650mAh large capacity lithium battery, which can talk for 17hours, and standby 1000hours(41days). • Easy to install on sun visor in car. • Auto connection or auto disconnection function, volume adjustment function and mute mode, you can talking and control it freely. Exvellent!! !Thank you I been searching for months for the perfect Bluetooth to my music in my car since my radio doesn't have an AUX plug.The sound is so loud OMG u would think it coming out of the radio...Go ahead and buy this u will not have no regrets. i recently purchased this and it works great. Plenty of volume and clear sound. Battery life has not been a problem. I have asked people that I am talking to about the sound quality and they tell me it is clear. If it continues to perform, you can't beat it especially at this price. 나름 만족해요. 음질도 괜찮구요. 크기도 작아서 귀여워요. 정말 마음에 들어요. 평소 갖고싶었던거라 결제하고 배송올때까지 엄청 기대하고있었거든요. 우선 가격대비 음질 좋은것 같아요. 사이즈도 너무 크지도 않고 가볍습니다. 제품 받앗어요. 너무 늦지 않고 불량도 없는것 같아서 감사합니다.